Burglars break in to 65,000 American homes per year. That’s a scary statistic, but you don’t have to become part of it if you know how to protect yourself, your family and your valuables. l Think that hollow plastic rock out front where you keep your key fools anyone? Never leave keys in hiding places outside the house. It’s a burglar’s job to know where to look. l Always keep your garage door closed and locked. Don’t leave it open the three inches for the cat to go in and out. If the cat can crawl under it, so can a burglar. l If you have bushes or hedges around your house, keep them well-trimmed so burglars can’t hide from the neighbors while trying to break in. l When you’re away, be sure to make it look as if someone’s home—put some inside lamps on a timer. Ask a neighbor to pick up your newspapers and mail. Arrange to have your lawn cut while you’re away. l If you must have decorative window panels on either side of a door, be sure that they’re made of unbreakable glass. l Doors with windows require a double key deadbolt. The key to a double key deadbolt should be left in the lock at all times when someone is home, in case of a fire or emergency. l Door hinges should always be inside the home to prevent them being removed from the outside. l Double hung windows can also be secured with the pin. Drill a hole at an angle through the top frame of the lower window partially into the frame of the upper window, then insert the pin. l Padlocks should be used on your garage doors, storage sheds, fence gates, or tool boxes. l Don’t forget to lock the doors when you leave. One-quarter of all burglaries occur due to a door or window left unlocked. l Engrave all valuables with your social security number. Engravers are available from each Crime Prevention Unit for a modest deposit fee. l Record the home address, social security number, and telephone number with the Police Department and this information will be put onto the NCIC computer system. Confiscated property can then be traced back to the owner. l Make a videotape of your valuables. 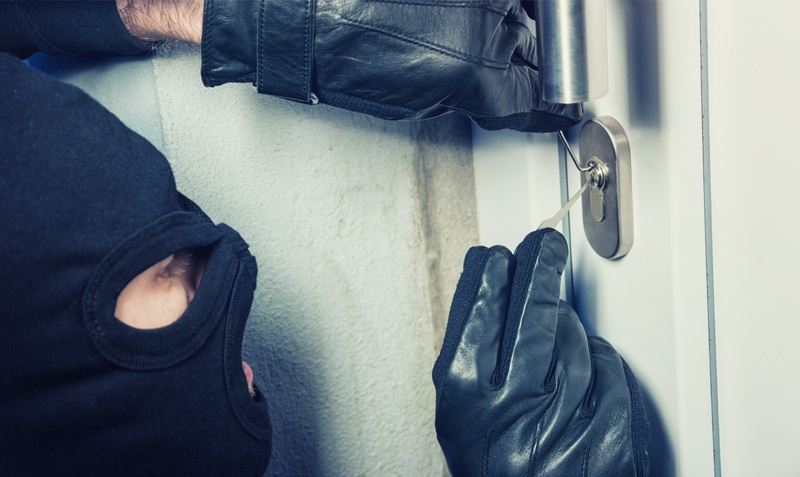 l Be aware of the times when burglars are most likely to strike—Easter, for example, or Mother’s Day, when a lot of folks are at church and then go out for brunch. This leaves a long interval for burglars to hit many houses on a street. Take extra precautions on those days. l Never carry duplicate sets of keys in your purse, briefcase or car. If your purse or car is stolen, which usually contains identification and home address, you might as well have just handed a key to the burglar personally. l Never leave a ladder outside or proper against the house. l If you have a keypad garage door, reprogram the code. l Even if you can’t afford a burglar alarm or a security service, you can still put a sticker in a window indicating that you do have an alarm. l Pull drapes and shades at night. Leaving them open is like being on a lighted stage in a dark theater, you and your belongings are clearly visible. Leave a light burning through the night.